SPY fell by 0.5% this week, while my account rose 0.5%. The loss-floor is now -11.5%, the same as its value on June 22nd. IAU: Doing great! Already over halfway to the +0.8% gain level, when the trailing stop will take over and start raising the max-loss floor. floor: Once again, the loss floor went briefly below -12% during the week, then popped back up by the weekend so I didn’t have to lower the bottom of the chart above. OptionsXpress: Asked them how to apply for API access. Reply: “At this time we are no longer providing access to our API. The information regarding our API that is displayed on our website is currently in the process of being removed.” I have cancelled my application to open an account with them. InteractiveBrokers: These guys seem to be the only ones left still offering an API to retail customers in Canada. Their gateway wants to run as a daemon and have the access password re-entered manually each time it starts, so not suitable for my current hosting service (I would need a virtual private server). Haven’t called them yet. SRTY: Another winner! But it could have been better: on Wednesday, the robot did not get its “buy” order entered until 11:00:43am, by which time the market had moved significantly from the top of the hour. On Friday, the 11am quote-fetch timed out, so the “sell” order was not entered. I put in a market order two minutes later, but (as usual) a limit-order would have been successful — and it would have salvaged the +0.2% expected gain for this trade. TZA: Normal swing trade in progress. URTY: The “buy” order was entered late because the robot took so long entering the TZA order just before it. I really need to investigate whether I can switch to InteractiveBrokers for faster quote-fetching. 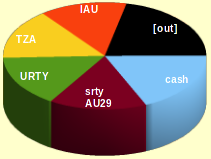 As usual, it looks like the URTY model bought too soon. I might have to sit on these shares for a week before the price starts moving upward. 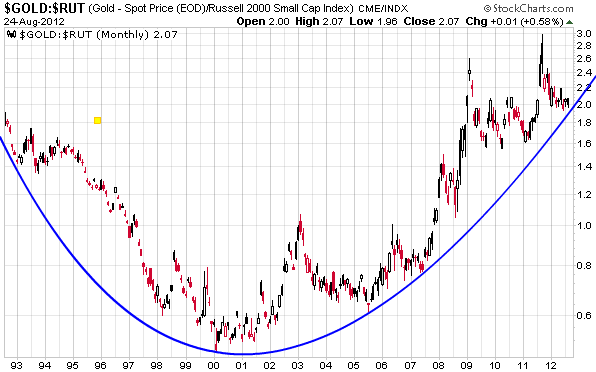 Here is a chart of the last 20 years, showing what happens if you buy gold and sell the Russell 2000. The charts for S&P500 and Dow Jones Industrials look about the same. The blue line shows a parabolic curve. I expect that this trend will continue until the year 2015 or so, when “Kondratiev winter” ends. As of today, this is the only long-term investment idea I have. Buy gold, sell equities, wait. It’s so simple!